Our latest competition is going to make one sports fan VERY happy. 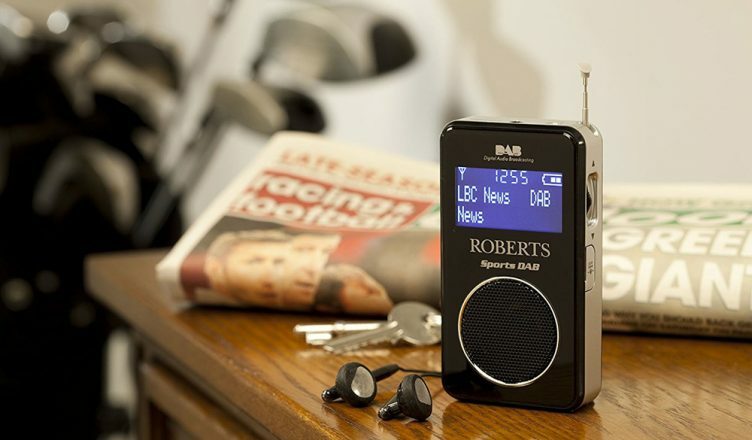 We’re giving away a brilliant Roberts SportsDAB6 in our FREE to enter competition. Read on to find out more about this cracking little piece of kit and learn how you can enter our latest competition. The SportsDAB6 is a must-have for any sports fan – although it’s not only for us armchair athletes. With a built-in speaker and headphone socket it’s equally useful on the move, in the kitchen, in the garden or keeping you updated while you’re at work. The built-in rechargeable battery means you can always be ready to listen to your favourite programme, belt out some tunes or catch the can’t-be-missed commentary. Roberts SportsDAB6 brings together the very best of radio – DAB+, DAB and FM; ideal for everyday use – not just big match days! In a sleek black glossy finish, with a matching speaker grille, the radio manages to look effortlessly understated yet modern. The Roberts SportsDAB 6 features a built-in speaker, perfect for those times when you want to go earphones-free (or if you forget to pack headphones). The headphone socket is robust and used as you’d expect and since the radio can be operated with one hand, using the multifunction jog/select rocker control, it’s great for walkers and runners, too. The volume control and on/off switch are located on the left-hand side, with the multifunction rocker on the right. There’s a ‘push to select’ action, making for easy tuning to stations from the DAB list and making selections from submenus, such as autoscan and manual tune, simple and straightforward, too. The headphone cable acts as the aerial when plugged in on the move so there’s no need to have the telescopic aerial sticking out of your pocket. You’ll find that you don’t need to raise the aerial in strong signal areas, easily able to listen through the speaker. The retracting aerial sits flush with the radio’s case, so can be stowed away when not in use. The built-in mono speaker is surprisingly loud for such a small unit, and despite it being a small driver, doesn’t produce a remotely tinny sound. It’s more than adequate for listening sessions out and about (a one and a half hour dog walk passes by sedately with The Archers omnibus!) If you want stereo on FM or from those stations on DAB or DAB+ broadcasting in stereo, plug in the supplied stereo headphones and you’re good to go. The Roberts SportsDAB6 can receive a huge range of DAB digital radio stations, such as Radio 5 Live, talkSPORT 2, BBC Radio 4 Extra and Planet Rock, alongside DAB+ channels such as Magic Chilled, Jazz FM, Fun Kids and Union Jack, among others. A truly portable radio, it comes with a built-in rechargeable lithium polymer battery pack that’ll give you around 15 hours when listening through the loudspeaker at regular volume levels and up to 18 hours when using headphones. There’s a handy hold key on top to prevent you accidentally changing channel or volume while the radio is in your pocket, and with the ability to store up to 20 station presets in the memory there’s instant recall via the ‘favourites’ menu. I particularly like the sleep function; particularly useful for some late-night shipping forecast update after a busy day of sport! The sleep function will automatically power down the radio after your selected time – from 15 to 90 minutes. In the unlikely event there’s nothing on DAB digital radio that you want to listen to, it’s simple to switch back to FM; thanks to RDS station naming the Roberts SportsDAB 6 will let you which station you’re listening to. At a shade over 5cm wide, 2.3cm deep and just over 10cm tall, the SportsDAB 6 is incredibly portable, slipping easily into a pocket. A set of basic in-ear earphones is supplied, although I prefer to use my favourite over-ear cans, via the standard 3.5mm jack. All told, this is the perfect pocket-sized DAB radio for sports fans – and everyone else! You can buy online, use our Click & Collect service to collect from your local store in as little as one hour or why not ask your local store about viewing our Roberts range.